Australian born and American based photographer Douglas Holleley has experimented with many aberrant photographic techniques over the course of his career. Holleley received a Bachelor of Arts in Psychology in 1971 at Macquarie University before relocating to America to undertake a Master of Fine Arts, studying at the Visual Studies Workshop in Rochester, New York between 1974 and 1976. Founded by Nathan Lyons in 1969 and affiliated with important photographers including Minor White and Frederick Sommers, the Visual Studies Workshop was a bedrock institution that fostered innovative photographic practice from the 1970s onwards. It was here that Holleley received tutelage from Ansel Adams in 1975. His early photographic output includes hand coloured black and white photographs as well as photograms and gridded arrangements of Polaroids. He later began experimenting with digital photography, applying the same principles of the photogram to his experiments with a flatbed scanner. During the time spent studying photography in America in the 1970s Holleley became interested in Polaroid technology. When he returned to Australia in 1979, before later relocating permanently to America, Holleley commenced an extensive photographic project of documenting the Australian bush with a Polaroid SX-70 camera, effectively becoming one of the first professional practitioners of the medium in the country. The resulting images were presented as a series and published as a book – ‘Visions of Australia’ – in 1980. 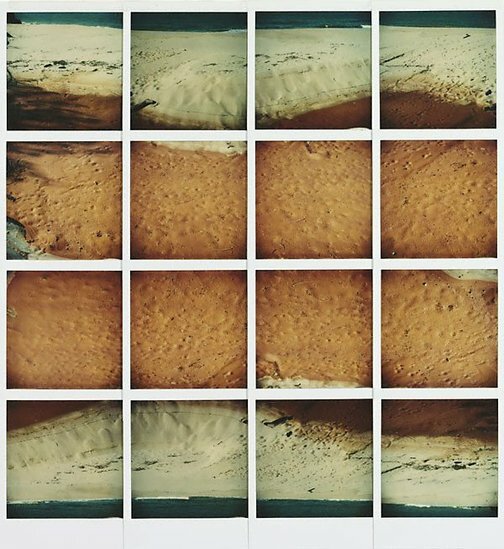 Employing a refined formalist vocabulary, Holleley produced photographic mosaics by arranging his Polaroids into gridded compositions. Dissected, disassembled and then collated within the pictorial frame, the landscape in Holleley’s works becomes slightly unnatural and detached. These works negate linear single point perspective by focusing on the ground and reducing the scene to a formal composite. Here, the expanse of the view and the horizon does not dominate the space of the image. The tessellating images produce a ‘whole’ that is slightly misaligned and unsettled. In some works, the photographer’s shadow is visible. It asserts itself as an ambivalent presence that is not tethered to the scene. This spectral form heightens the sense of disquiet that pervades the images. Signed and dated l.r. board, pencil "Holleley 79".